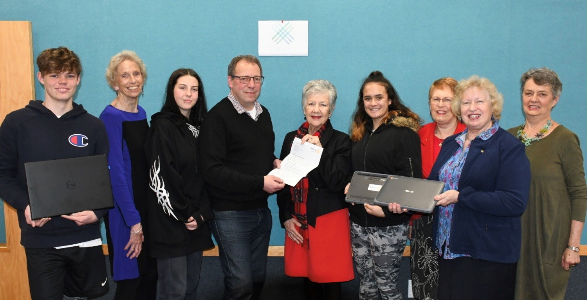 On 6 July, club members visited Te Ara/ the Wellington Activity Centre to present ten laptops and chrome books for the students’ use. RCW has donated $6,900 for this equipment and an upgrade of IT services to enable students to do online NCEA and other studies. The centre takes up to 20 young people referred from local secondary schools for behavioural and attendance reasons. They follow a mix of formal education courses and targeted developmental programmes, with the goal of returning to the education system or moving on to the paid workforce. During the visit, members explored ways in which RCW’s Youth and Community Services Committees can help develop a continuing relationship with the School. CSC is currently putting teachers in touch with speakers on career opportunities for the students and helping with contacts for careers-focused outings. Next steps will be to invite club members to take part in mock interviews preparing students for work applications, or to volunteer occasionally to cook weekly shared lunches with the classes. Original generation time 2.9697 seconds. Cache Loaded in: 0.0005 seconds.